Please find in the tabs below details of our ASUK conferences. The ASUK Family and Professional Conference took place at the Aston Conference Centre in Birmingham on the 6th and 7th October 2017 and it is fair to conclude that it was a HUGE success! 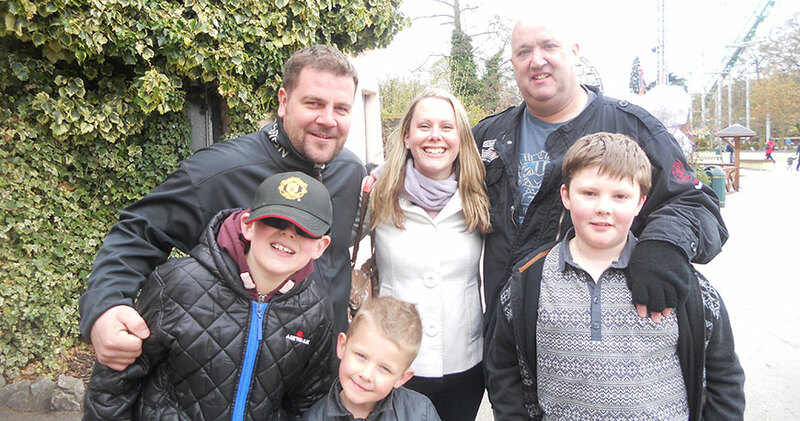 The event brought together families, individuals and professionals from the UK and across Europe to learn more about this ultra-rare condition. So many people contributed to ensure that everything ran smoothly and participants had lots of time to network, catch up with old friends and find out about research as well as new project initiatives. We have received lots of positive feedback about the presentations, the workshops and the fun stuff! 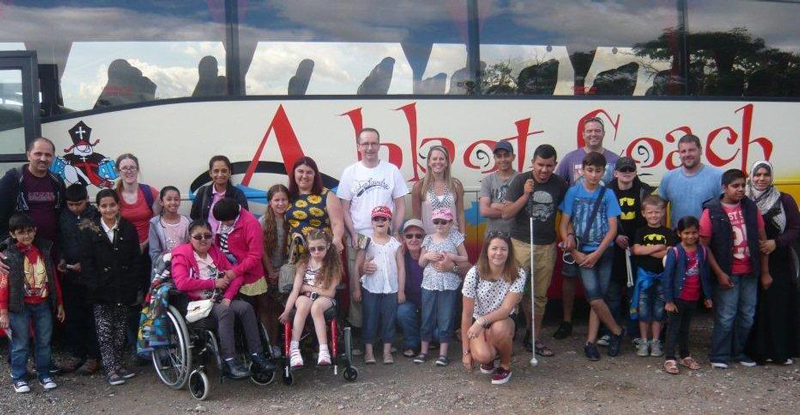 Hear from mums, Julie and Pam as they discuss why the ASUK conference is important to them. As well as giving a truly insightful parents perspective of being affected by one of the rarest conditions in the world, Alstrom Syndrome. The graphic below was produced during the conference to capture this truly memorable event. We hope you all found the 2017 conference as informative and inspiring as we did. 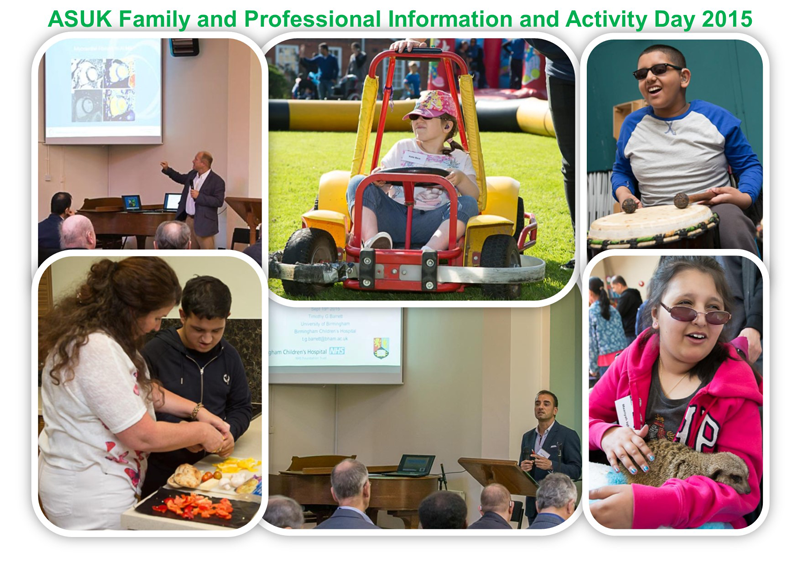 On the 19th September 2015, our Information and Activity day was held at New College Worcester. It was great to see so many families enjoying themselves throughout the afternoon with fun filled activities and informative workshops. 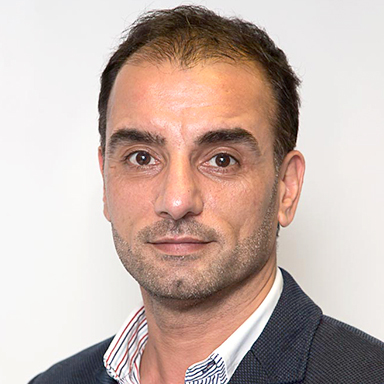 The day was chaired by ASUK Trustee Kez Hayat and the morning sessions featured our future research projects, clinical updates and information sessions. In the morning, we had clinical presentations from our AS medical teams, Dr. Tarek Hiwot, Professor Barrett and Dr. Rob Cramb and Dr. Rick Steeds presented his cardiomyopathy study findings and updates. 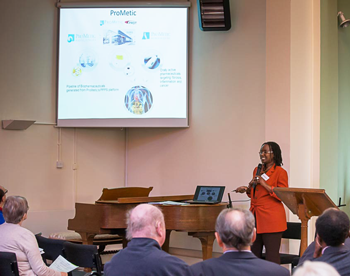 Families then had the chance to listen to Aline Hagerimana, Director of Clinical Affairs, from ProMetics (pictured below) who had travelled from Canada to give families an overview of the fibrosis clinical trial. This was followed by a presentation from Dr. Richard Paisey about the proposed ‘lifestyle study’ researching the effects of a healthy lifestyle and how this can help patients manage their condition more effectively. Jane Lodwig, Rare Disease Project Manager at University Hospital, Birmingham showcased the new Rare Disease Centre and explained how these plans were coming together. Before lunch, Sue Bushell, Community Engagement Officer from Guide Dogs for the Blind gave an overview of the work of Guide Dogs for the Blind and provided useful information for families. Families embraced the opportunity to chat with the professionals and medical experts attending the conference and the chance during the panel discussions to ask any questions in a relaxed and informal manner. At the event, the ASUK Team were on hand to support families to ensure they enjoyed a range of activities including circus skills, drumming, horse-riding, go-karts, zorbing, swimming, bouncy castle, mini-zoo and archery. Workshops were held in the afternoon and these included healthy eating and cooking workshops and technology demonstrations. Hands on activities such as the mini-zoo were great ways that members affected by sensory impairments could have a memorable experience. The zoo proved very popular for families to be able to hold and feel exotic animals such as ‘Alex’ the meerkat (pictured below) who proved a real hit! In the afternoon we held a number of information and support sessions including a Mums/Female Carers Workshop which was facilitated by Iram and Dads/Male Carers support session which was facilitated by ASUK Trustee Kez Hayat. The running theme of the workshop was around the child with Alström and their journeys in living with this complex condition. The sessions provided mutual support and enabling each other to feel safe enough to share their own experiences and learn from each other. These sessions went really well and the overall consensus was that participants really value coming together to talk about their experiences and to learn and network from each other, which they feel is very powerful. The healthy eating workshop provided a chance for families to create some quick and easy healthy meals with Natalie Bufton (New College Worcester, ILS Teacher), Marie McGee (ASUK Transition Coordinator) and Sarah Boocock (Dietician at UHB). Families also had the opportunity to have a go at Goal Ball with one of our members, Liam Mackin and gain further information from Guide Dogs for the Blind and Dolphin Computers as well as technology demonstrations. A huge thank you to New College Worcester, their support and facilities were excellent to provide both activities and conference presentations. Tours of the college were available throughout the afternoon to enable families to ask any questions about the specialist school. It was great to see so many families enjoying the activities in the afternoon, every activity was accessible and provided fantastic opportunities for everyone to have a go no matter what their disability – proving it is what you can do that is so important. During the Annual General Meeting which was Chaired by Michelle Hough, families and professionals came together to learn more about the charity’s work over the past year and our priorities moving forward. Before leaving everyone had the opportunity to socialise together as they enjoyed a delicious two course meal, followed by a fun raffle before travelling home. The ASUK Family and Professional conference 2014 took place at the historic and beautiful Brunel Manor in Torquay on Saturday 16th August 2014. 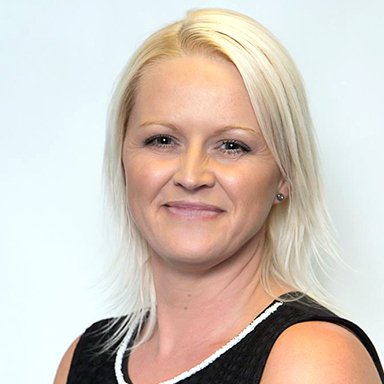 The conference was chaired by Trustee Kez Hayat and ASUK National Development Manager Kerry Leeson-Beevers (pictured below). The morning sessions were centred around current and future research projects. Dr. Rob Cramb, Consultant Endocrinologist at Queen Elizabeth Hospital in Birmingham gave updates about the AS Clinics and current research projects which families have been involved in. ASUK Founder and Director, Kay Parkinson went on to explain about the potential funding from the Horizon project and how we would work at a European level. This was followed by Hans Erik Frolander who travelled all the way from Sweden to discuss the Theory of Mind research study and gave an insight into how the interdisciplinary teams in Sweden work. The AGM followed which was chaired by ASUK Chair, Michelle Hough who gave an overview of the charities activities over the last year and gave the Trustees and Managers an opportunity to explain more about their roles. Mark Millais who has been an ASUK Trustee for many years, decided to step down from his role but he would like to remain involved in the annual ASUK bike ride which is currently being organised. Mark has been a dedicated and committed Trustee, always putting the needs of our patients first. ASUK would like to give our sincere thanks to Mark for his commitment and for his many years of service. The afternoon sessions focused on family support and advancements. ASUK Family Support Manager, Iram Shah explained how ASUK can help and support families and her own personal story of living with the condition. Marco Gregnanin, CEO Itex Technology gave an overview of technology advancements and Katie Barron from Contact a Family gave an insight into how the new SEN reform will affect families across the UK. This was then followed by Support and Advice sessions which gave a wonderful overview of organisations throughout the UK who are there to help. The sessions were presented by Jackie Ekers from the Citizens Advice Bureau who gave an overview to welfare and benefits, Lorna Mackie gave an overview of the services which Sense offer, Michelle Woolf showcased the services which Action on Hearing Loss offer families and Josh Allan from the Calvert Trust, Exmoor gave a presentation about their fabulous activity centre. During the day, whilst their parents attended the conference the children had a fun-filled day out at Crealy Great Adventure Park. The children enjoyed the exciting rides, getting wet on the water slides and fun in the indoor ball pools. The children really enjoyed their experience and were returned to their parents exhausted after their exciting day. A HUGE THANK YOU to all the volunteers who helped on the day, without your support the outing wouldn’t have been able to take place. 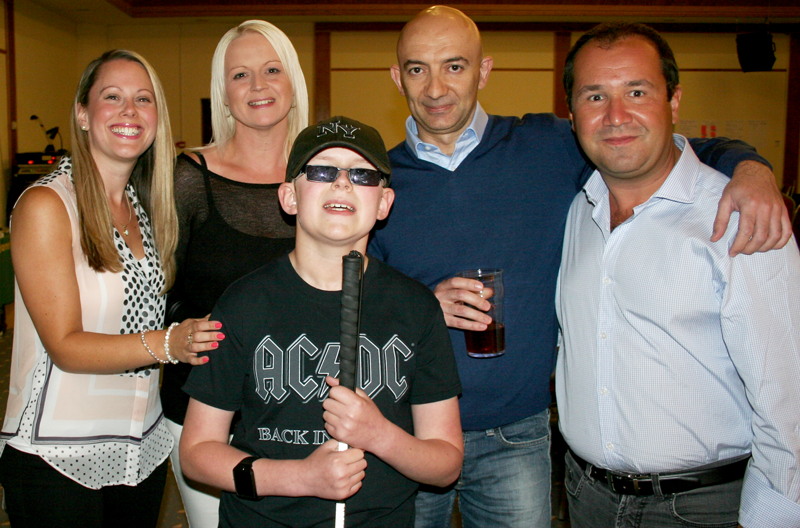 The evening was a fabulous chance for families to get together and catch up which included the ever anticipated charity auction. This year we also ran a pop up bar and asked attendees for donations for our great cause. The auction and bar raised £925.00 which is excellent. During the evening we also celebrated Rida’s 9th birthday with a fabulous princess cake. Thank you to everyone for making our 2014 conference such a success. Thanks to the speakers who were excellent and gave very informative presentations and special thanks must go to those who travelled from Italy and Sweden to be with us. Thank you also to Simmie Gould who gave massages to delegates throughout the day. Most of all, thank you to our families who travelled to Torquay to take part in the conference. We have received very positive feedback and the ideas and contributions you gave during the conference will be used to develop the services we offer and will help shape our five year strategy. Unfortunately we did not have as many families and professionals attend as in previous years and we do accept that holding the conference in Torquay in the middle of summer may not have been ideal. The reason for this decision was that we have seen a decline in donations to the charity due to the current economic climate and we have needed to make some savings during 2014. However, we do understand how important the conference is to families and we will be thoroughly evaluating this conference and taking your suggestions on board when planning our next one. As part of this evaluation, we would like to consult those who did not attend this year to gather additional feedback. A questionnaire will be circulated shortly. Our charity continues to grow from strength to strength and we firmly believe this is because we continue to remain patient led and focus on issues that are important to those living with Alström Syndrome. Thanks again and we look forward to seeing you all at our next conference! On the 28th April 2013 we held our family and professional conference at the Menzies Strathallan Hotel, Birmingham. Children who attended the conference had a fun filled day out at Drayton Manor theme park, thank you to all the volunteers who kindly gave their time to help on the day. The conference was a great success and was filled with interesting research talks in the morning and family workshops in the afternoon. Families really appreciate the time together and they really enjoyed the presentation by award winning Liam Mackin who is affected by AS, many families thought his presentation was truly inspirational, well done Liam! During the conference families attended the ASUK Annual General Meeting. Whilst the adults are at the conference the children are taken for a fun-filled day out. 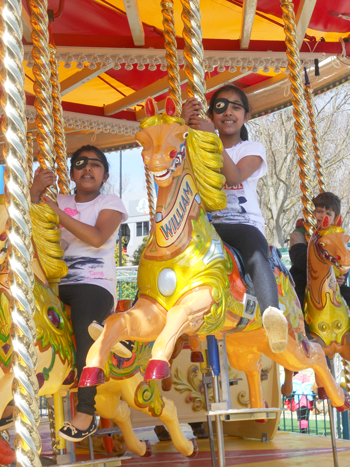 This year we went to Drayton Manor Theme Park, the weather was glorious and the children had a great time.